Pfc. Clifford H. Timms, Jr., son of Mr. and Mrs. C. H. Timms, attended Frederick High School; husband of the former Modean Pounds. 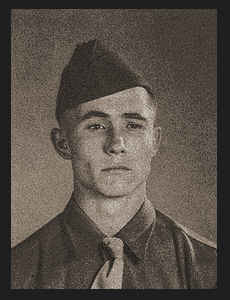 Entered Army in Oct., 1944, trained in Ft. McClellan, Ala.; served in France, Belgium, Holland and Germany; is now on duty in Camp Breckinridge, Ky. Awarded Good Conduct Medal, ETO Ribbon with one Battle Star, Combat Inf. Badge, Victory and Occupational Ribbons.